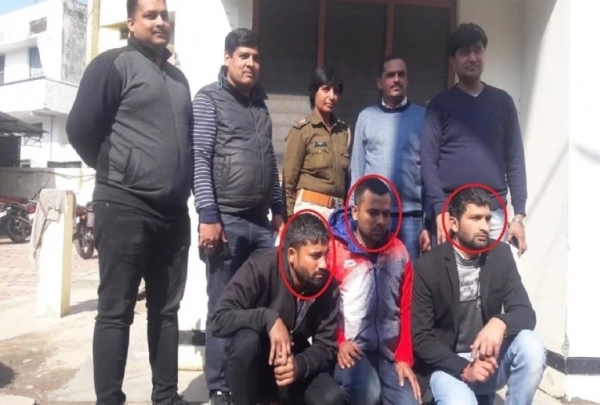 The STF Meerut team has arrested two members of the solver gang, who are accused of taking lakhs of rupees from candidates, in the name of successfully conducting the exams with the help of a false solver. Five members including the gang leader Arvind, who belongs to Aligarh, have fled. The police have placed search teams to find them. On the other hand, Sonu who belongs to Hajipura, Aligarh and Mohit, who belongs to Udaipur village, has been held captive by the Nohjheel police. Several things like Bluetooth devices, OMR sheets, blank cheques, mark sheets, mobiles and the admit cards of the recently held Subordinate service selection exams; have been procured from the culprits. The police have claimed that the accused have given away the names of the rest of the team members. The police are now trying to catch hold of the remaining members of the gang. The sources also revealed that these gang members took 5 lakhs rupees from candidates and sent a professional solver in place of the candidate, to sit in the exam. Apart from Uttar Pradesh, this gang also has links in Rajasthan and Haryana. Catching hold of the situation, STF closely monitored the examinations that were held on 6th January for the post of Assistant Teachers. STF has already started finding and extracting further details about the solver gang. The places that are under strict surveillance are Uttar Pradesh, Agra, Saharanpur, Meerut and Ghaziabad. Things procured from the accused that were caught included- Electronic devices, 2 Bluetooth, 2 Aadhaar Cards, Pancard, Mark sheet, Admit card, 3 photographs. Further to the investigation, several other members of the solver gang are being caught by the police n various parts of Uttar Pradesh and Haryana. It is a massive gang that takes Lakhs and Lakhs of Rupees from aspiring candidates. STF Meerut team has been successful in capturing seven members of the solver gang. Though the gang leader Fatehpur has fled, but the search is still on. Similar equipments and things have been procured from the gang members and they are under strict examination along with Rs. 1, 65,000 cash.